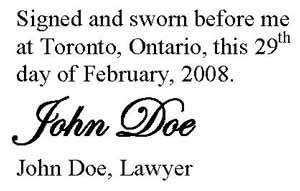 Written statements given by the affiant on an oath of truth, are called affidavits, written depositions, sworn statements, solemn affirmations, solemn declarations or statutory declarations (“statutory” because in some instances, the authority to set out sworn evidence is found in a statute such as the Canada Evidence Act, §41). By whatever name they go by they have the common feature of being written in the first person by an identified affiant (aka ‘deponent’ or ‘declarant’), regarding evidence of which that individual has first-hand knowledge, witnessed themselves or, if they are relying on another source, identifying that source, all of which the affiant swears that the contents are true, in front of a commissioner of oath, a notary or an attorney/lawyer. All Court hearings require evidence. You cannot just go to court and asked the judge to give you relief without offering evidence. Self-serving statements made by lawyers on behalf of their client is not enough although too many judges lacked diligence in this regard and to grant relief based in whole or in part upon a statement by a lawyer. Affidavits, because they can be prepared in advance and allow the judge to absorb the evidence as quick as she can read, are the most convenient forms of evidence. “In recent years the circumstances in which hearsay evidence is admissible at trial have expanded...” (Chamberlain v Surrey School District 36). The rule against hearsay is thus relaxed in affidavits but there is gross inconsistency among judges in the exercise of their discretion in this regard. As a rule of thumb, the scale of hearsay acceptability is highest for interlocutory, provisional or temporary court orders, and lowest where the relief being sought is of a final nature. Just as for witnesses testifying in court, an affiant is not permitted to give opinion evidence or argument in an affidavit (the only exception being a qualified expert). Judges are not required to accept questionable or not credible evidence; and that goes for affidavits as well. Even though the evidence in an affidavit appears to be un-contradicted, no judge is obliged to render judgment based on a single particular affidavit. He or she always remains the gate-keeper of evidence. Just as with regular testimony in Court, evidence tendered by affidavit will be inadmissible if irrelevant, particularly if scandalous, oppressive, embarrassing or judgmental, or where privileged facts or documents are submitted (such as without prejudice letters which contain settlement proposals or statements made at mediation). “Having dealt with the merits of the applications, I wish to say that I consider much of the material filed on both sides to be of poor quality. "There are unsworn letters attached to the affidavits that express the opinions of their authors. Save where they may be admissible as expert opinions they are inadmissible. “There are adjectival descriptions by one side of the alleged acts or statements of the other. They are irrelevant. The affidavits should state the facts only, without stooping to add the deponents descriptive opinion of those facts. It should be left to argument to persuade the trier of fact what view he or she should take of them. For counsel to permit affidavits to be larded with adjectives expressing an opinion about the conduct of the other side contributes nothing to the fact finding process. On the contrary, it does a disservice. It exacerbates existing ill feeling, it pads the file with unnecessary material and it wastes the court's time. In most jurisdictions, swearing an affidavit which contains information known to be false is a criminal offense. The secret ingredient to all affidavits is the jurat which confirms the affiant’s oath as taken, and certified by the swearing officer, often referred to in Canada as a commissioner of oath. The jurat (see sample, pictured) comes at the end of the affidavit and distinguishes an affidavit from an unsworn statement, the latter not acceptable as evidence in a court of law. Our justice system relies on a witness telling the truth. Witnesses, either through testimony in open Court or through an affidavit, do this through an oath: the binding of their conscience, fear of God or a solemn affirmation. Either way, the affiant puts their personal honor on the line and expose themselves to criminal prosecution in the event of a lie. For affidavits, this commitment of conscience is confirmed by the jurat which takes the form of the commissioner of oath’s confirmation that the affiant swore aloud the contents of the affidavit to be true, directly to the officer, and then the commissioner confirms this by signing and printing his or her name, or stamp of office, under his or her signature. The Commissioner should ensure that the affidavit is that of the witness, and to satisfy him or herself that the witness understands and intends every statement in it. Once an affidavit is signed by the affiant, it cannot be changed. Even hand-written changes made before signing require initials in the margins. Under the ancient rules of common law, a lawyer was prohibited from acting as oath-taker of his own client’s affidavit. That rule has thankfully been abandoned. But some lawyers now go too far and often file their own affidavit on controversial facts, or that of their legal secretary, within their client’s lawsuit, later claiming that the evidence so-tendered is on a minor point or on procedural matters. Affidavits always expose the affiant to cross examination on the affidavit, although this is rarely sought. But once a solicitor or the legal secretary has filed an affidavit, they become material witnesses and are so exposed, thus compromising their client-solicitor relationship. At this time, judges are very inconsistent in regards to the allowing lawyer affidavits in their own client’s lawsuit. What began as a trickle is now a torrent such that they are common occurrences, even from experienced lawyers. Usually, but not always, affidavits have a special annotation at the top which declares the context in which it is given. If it is tendered as evidence in a lawsuit, that lawsuit will be identified at the top of the affidavit identifying the court, the court action or file number, the name of the parties in the litigation, followed by the name, occupation and address of the affiant. In fact, this is often required where the affidavit is intended to be used in a Court hearing although most jurisdictions have provisions in the rules of court to excuse minor errors as to the form of an affidavit. “On February 12, 2008, at about 3:00 PM, I was on Cortes Street in Puerto Vallarta, Mexico, on the sidewalk, jogging against traffic. “It was a clear sunny day and traffic was very light. “At that time, I observed a large white van coming towards me at fast speed, swerving slightly from left to right. I stopped jogging as the vehicle appeared to be somewhat out of control. “As the taxi approached, I could see written on the front the words ‘Sayulita Taxi’. “I observed the top of the taxi driver’s head as he appeared to be hunched over and not watching the road ahead. An affidavit can attach documents as “exhibits” if the affiant, by setting it out clearly and thoroughly, describes the document and needs it to complete her or his evidence. Sometimes, it is easier to include one’s own existing document rather than reiterate facts already set out in those documents. These documents are numbered or lettered from the order of presentation in the affidavit, as in Exhibit A, followed by Exhibit B, and so on. If not sworn to as to the “truth of its contents”, a exhibited document is merely identified and its probative value minimal. It is very dangerous to attach another person’s document (especially another sworn statement) or to suggest in an affidavit that, for example, you only adopt as true specified parts of an exhibit. That will rattle any judge and jeopardize the entire affidavit under the hearsay rule. More than one person can swear to the contents of an affidavit in which case the jurat is amended to refer to the oath being given “joint and severally before me”. Affidavits are tricky business and can be picked on by a surly judge to dismiss your case. Be careful and follow the guidelines set out above which should assist you in the preparation of an excellent affidavit such that upon reading it, the judge will surely sigh, wipe a tear from his her wise eye and exclaim “Wow! That was sooo convincing and well-written. I totally believe this affiant and see where they are coming from. It’ll take a heck of an affidavit in reply to overcome this!"